I tested these boots while ago, but never got around to publishing my review. Here it is in case anyone finds any use from it. Stiffness: I found them to be every bit as stiff as my TLT5P without tongues(carpet test, locked in skis), in fact a bit more stiff, but not much(I think this is mostly due to the fact that I can make them tighter on my chicken legs. Sizing: I can go down a size to 25.5 shell(277BSL). I did a shell fit and found the 25.5 fit comfortably. I didn't feel toe pressure in a 25.5, but the forefoot volume is a little low. Whereas in the TLT5 26.0 I have to tighten the instep buckle more than half its range, in the Spitfire 2.0 25.5 I am on the loosest edge of the instep buckle range. In the TLT5P I use the felt pad under my Sole thin footbeds to take up volume. In the Spitfire I was using my footbeds, but nothing else to take up volume. Climb Mode: The range of motion is significantly better than the TLT5P with CL liner. It is both greater range and with less friction. Rearward range of motion can be obstructed by the ski mode exoskeleton catching on the rear of the cuff, but after a few times going through the motion that seems to clear itself up. More on the mode change and exoskeleton later. I didn't notice any heel slop when in ski or climb modes even with the instep buckle loosened(this is likely due to inattention and non real world testing conditions). 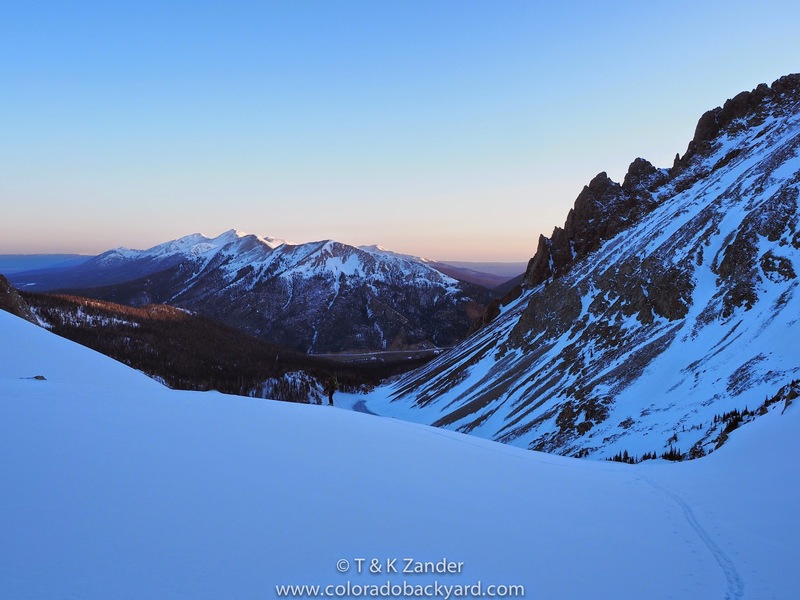 I set out the first weekend of April to ski from Cameron Pass to RMNP with Mark Koob. We had attempted this traverse a few years ago with another friend, Travis, but decided to bail at Lake of the Clouds after unfavorable weather. Using the knowledge gained from the last time I set a more ambitious goal of also summitting all the peaks from Richthofen to Baker and getting as many ski descents in as possible. We didn't have any car shuttle help, so had quite a bit of driving to do with 4 hours on Friday night and 5 hours on the return on Sunday night. We started at the Crags trailhead at 4am on Saturday moving quickly to warm up. It was quite cold. I was wearing my micropuff under my helmet and had on windshells plus a hand warmer over my gloves. We had warmed up by the time we got past Agnes Cabin and we could start to see the moon losing some of its disk to the eclipse. Unfortunately we followed an existing skintrack in the dark and ended up on the flank of the wrong mountain(Braddock Peak). After breakfast burritos we realized our mistake and decided to ski traverse around staying as high as we could. Mark left his skins on and his splitboard in ski mode while I ripped and locked my heels. We skied through a number of large slide paths that had gone big within the past few years. One in particular felt almost like walking though burned out forests north of Steamboat Springs. It was eerie. The snow was in great shape with 4-6 inches of fresh on top of a nice stable base and we had high expectations for our descent down Richthofen's SE face later in the morning. We skinned up past Lake Agnes and made good time to Richthofen's shoulder. Amazingly the fresh snow made for easy skinning with no ski crampons required. When we gained the ridge we were cold again with significant wind and while the sun was hitting Mahler Peak to the west of us, it would be awhile until we were blessed with its warmth. The hiking up the ridge was treacherous with the talus being loose and only covered with the most recent storm. It made slow and frustrating progress. When we got the view of our planned descent we were disappointed to find dry talus where there was plenty of snow on our last attempt. We started to climb down the talus to a ribbon of snow but that felt unsafe due to the steep pitch. I kicked off a large block and it kept bouncing past my view. So as soon as possible I put on my skis to sideslip the 'ribbon of death.' It is even more fitting here than early season at the resorts, and fall would have been very dangerous and the snow was narrow and very firm. 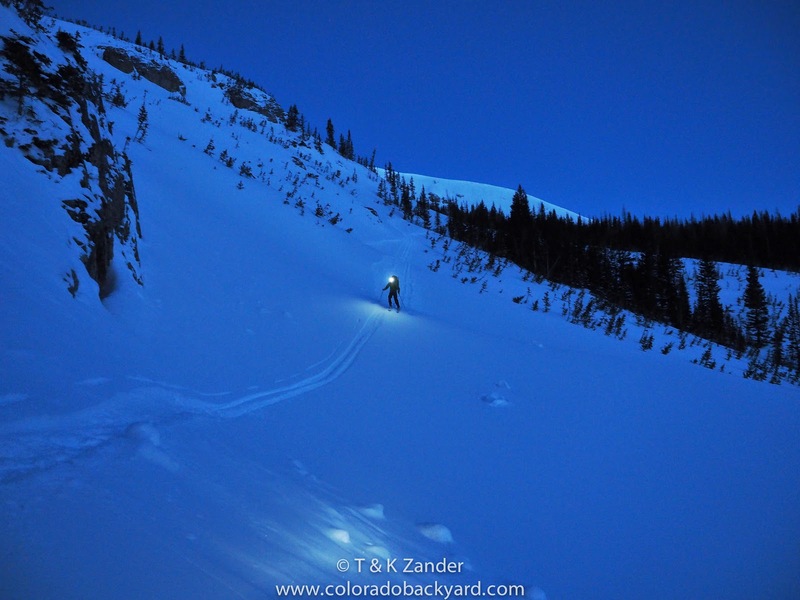 I did manage a few turns in a small powder deposit before traversing hard right where we had made it down in 2013. I had to cross another talus field with fresh snow on top of dry rocks. This was possible by stepping with my skis, but I worried about how Mark, on a snowboard, would manage it. I managed to avoid any coreshots, but did definitely cause a little pain to my edges and bases with this maneuver. I kept traversing until I could see a line that I was reasonably sure would go. Due to the steepness and the fact that the slope rolls over I couldn't be certain that skiing down the snow I had just traversed would have gone, but in the future I would like to do a bottom up ski of this pitch because there are some very interesting lines to be had with the right beta. I skied down a narrow ramp with variable snow until I could see for sure that I would make it down and then turned my attention to Mark. Given the dearth of information out there on the new Atomic Pintech bindings, I found their catalog and translated the information. Pin bonds have taken a tremendous development in the last 20 years. You are now an indispensable part of the normal touring equipment. What our new back country tour and back country tour Light bond apart: This practical, lightweight, Pin-bond is incredibly sturdy and makes entry and operation super easy. It is Tell our back country sportsmen everything they need in the backcountry, convenient and easy to use from a single source. With the patented Easy Entry on the toe of the shoe is automatically positioned correctly and the pins lock securely in the boot. So boarding succeeds quite intuitive. The climbing aids function independent of the buttocks and can easily be folded forward in each rotational position of the rear jaw. One click, and you can choose between 3 stages: 0, 7 and 13 - for optimum support on every rise. The range of adjustment amounts in this binding are 30 mm; more than in most other pin bindings is possible. Therefore, it is easier to various ski shoe great customizable (and thus ideally suited for the rental). The extra secure screw with 40mm mounting distance improves performance on wide skis and reduces the risk of tear out. One of the lightest binding on the market: the back country tour with their 592 gr. I wrote this a while ago, but had not published it out. It may be useful information for someone looking for a dayhike in the Vienna, Austria area so here goes. I recently had a day off from work in Vienna and so I headed to Schneeberg to get a day hike in. I found getting there to be super easy, just take the subway to Philadelphiabrücke which is also the Wein Meidling train station and buy a ticket to Puchberg am Schneeberg and take the first train to Wein Neustadt. These trains are very frequent, I would say about 5 an hour. At Wein Neustadt look at the boards for trains to Puchberg am Schneeberg and then hop on. This train runs every hour all day. Since we have gotten some better fast race skins the question came up of what to do with the Black Diamond mohair skins left over. 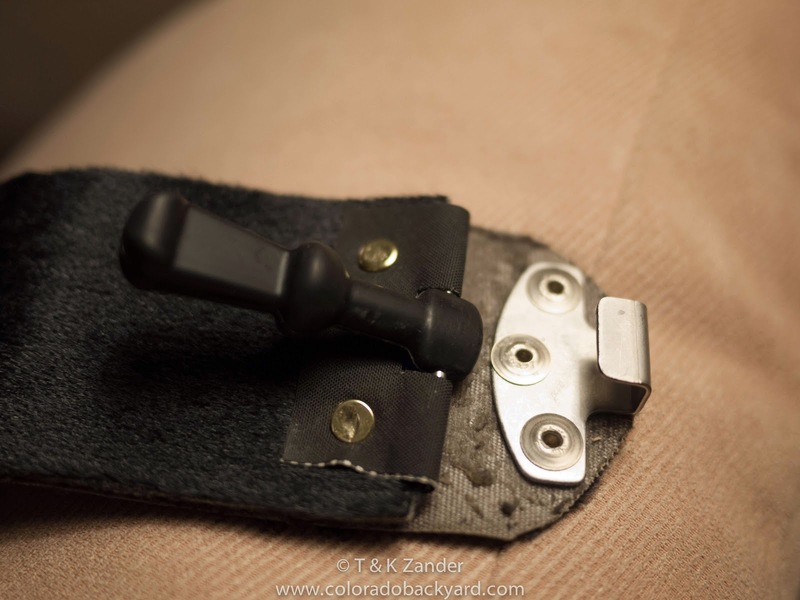 I decided to make a pair of backup full length skins with a tail clip for Kate's skis with one pair of them. TGZ + KPCZ. Simple theme. Powered by Blogger.